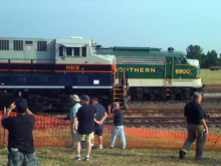 Ok, on June 27th, 2012, I stumbled on the Trains Magazine article online on how the NS Heritage units will all be together at the North Carolina Transportation Museum on July 3-4. I'm thinking it would be neat to go down and see them all together. I only have July 4th off, so I'm trying to figure out if I can drive down there from NJ, get pictures and make it back before work the morning of the 5th. I could leave work the 3rd, drive like and idiot to NC (10 hours), get 4 hours sleep and be at the museum to see the fleet. Now I realize that I need to drive 10 hours home after all that. Not really going to work. While at a BBQ on Saturday, June 30, Jules and I started talking about how neat it would be to see the NS Heritage units all together. His wife looks at him and says, "You were just talking about that, you should go with Jimmy." Now there are two drivers. This might be do-able. Doug comes over and asks what we're talking about. We tell him the story, and he says, "I'm in, what time are we leaving?" Mike, who's throwing the BBQ, thinks we're nuts and starts trying to work out how he can go too. He doesn't think he can sit in the car for 20 hours of driving in 40 hours, so he bows out. Jules starts to think who else would like to go. He comes up with several names, and I remind him that more than 4 means a 2nd car and a 2nd driver at all times. We lower our expectations and only look for a 4th person. I call my dad (Bob) and see if he wants to join us. He checks his schedule and joins us. Jules and I go to work on Monday, July 2nd (we work together). He talks to the boss before I get in and lets her know about this stupid trip were going to take. He tells her that she should give us the 3rd and 5th off so we can make the trip a little more managable. When I get to work, the boss is telling me that I'm off on Tuesday and Thursday, "Have a nice trip." Doug and Bob can also get Tuesday and Thursday off. Now its 20 hours of driving over 72 hours, much more managable. Doug, Jules, Bob J and I drove down to the North Carolina Transportation Museum in Spencer, NC on July 4th to see the Norfolk Southern Heritage units on display. We got to see a parade of the units in the morning. Then the heat index shot up to 103 degrees in the afternoon and we though it was time to go. I took video of all the units in the parade, but only got selected engine stills. Here's the stills, I'll add video stills of the other engines later. Check out our GSC Video page to see some of the videos we shot. When we arrived, all 20 engines were all in the roundhouse around the turntable, grouped by family (L-R Norfolk and Western, Conrail & Southern). 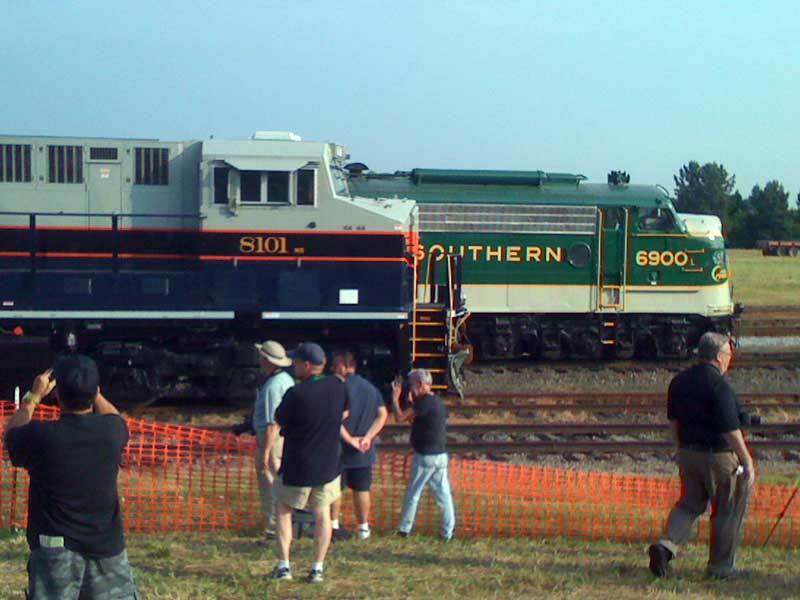 The Central of Georgia unit passing the museum's Southern E-8a. 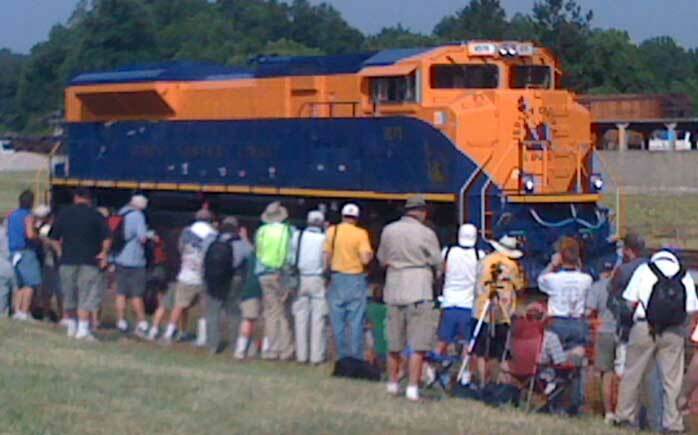 The CoG had trackage in Georgia, Alabama, South Carolina and Tennessee, and was part of the Southern family. Another shot of the Central of Georgia unit. The Interstate had trackage in western Virginia, and was part of the Southern family. The original Norfolk Southern route had trackage in Virginia and North Carolina, and was part of the Southern family. The New York Central had trackage from Boston to St. Louis and all states inbetween, and was part of the Conrail family. The Penn Central formed from the merger of the Pennsylvania, New York Central and New Haven railroads, and was part of the Conrail family. The Erie had trackage in Pennsylvania, New York and New Jersey, and was part of the Conrail family. The Delaware Lackawanna and Western had trackage in Pennsylvania, New York and New Jersey, and was part of the Conrail family. The Jersey Central Lines or Central Railroad of New Jersey (CNJ) had trackage in New Jersey, Pennsylvania and New York, and was part of the Conrail family. Another shot of the Jersey Central unit.